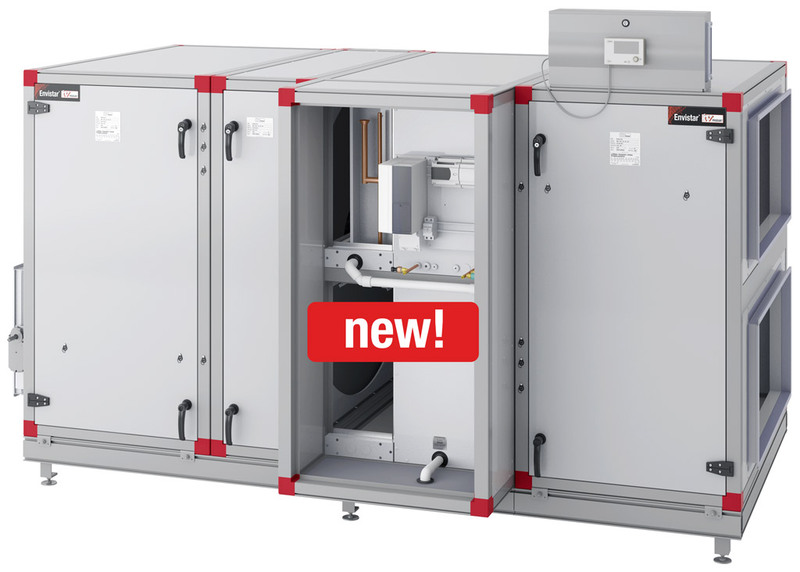 We are introducing an integrated reversible heat pump that simplifies installations and lowers running costs. After a lot of research, calculations, comprehensive field-testing and accurate measurements in our Innovation Center, we are now ready to launch our new product ThermoCooler HP. The reversible ThermoCooler HP heat pump can be integrated in our Envistar Flex units. On a cold winter’s day at -20 °C, IV Produkt’s unit with ThermoCooler HP can blow in a supply air temperature of 20 °C with a return air temperature of 22 °C without any additional preheating. If the rotor has an efficiency of 83 %, the ThermoCooler HP heating/cooling pump together with the rotor can achieve a dry temperature efficiency over 90 %, excluding the electricity from the compressor. Transport in. When IV Produkt develops products, it is important that the units are easy to transport into buildings. ThermoCooler HP has therefore been designed in separate module sections that will fit through an opening of 900 mm. Installation. As the whole installation for cooling and additional heating for ventilation is integrated in one unit, there is no need for expensive and large pump sets or plumbing. The responsibility for the installation lies with the supplier instead of several different parties. Operation. As ThermoCooler HP does not need defrosting, the compressors and coils have a longer service life. The operating costs for cooling and heating are therefore significantly less than for a traditional installation with pump sets, cooling medium coolers and liquid coolers. Value adding. The ThermoCooler HP cooling/heating pump frees up space on the roof, creating a fifth facade. The roof surface can be used as a pleasant terrace with endless possibilities. The property becomes more attractive, space is freed up, the value increases and the rental income increases.